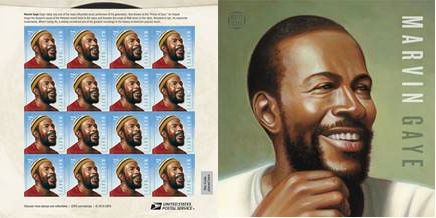 Marvin Gaye stamp pane. (Courtesy: USPS)The stamp pane is designed to resemble a vintage 45-rpm record sleeve. One side of the pane includes the stamps and brief text about Gaye’s legacy, with the image of a sliver of a record seeming to peek out the top of the sleeve. Another portrait of Gaye, also inspired by historic photographs, appears on the reverse along with the Music Icons series logo.